Hockey Sport Star Resin is adorned with a star behind the hockey puck held up with an array of shooting stars. This Ice Hockey Live Action award has many unique features that set it apart. Boasting a hockey player focusing hard on the puck and getting ready to let the puck fly all set against a gold and black tone action ribbon gives the award a dynamic look. A black hockey puck completes the look. This award stands 8" tall and has plenty of engraving area on the base to accommodate your personalization needs. 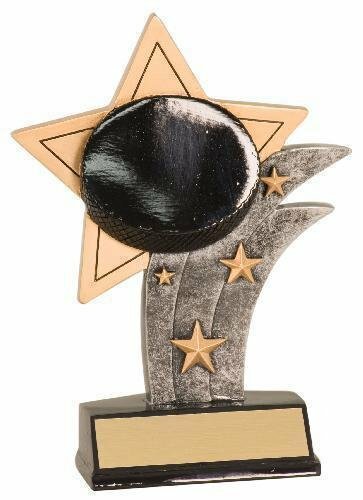 The gold and pewter finish highlights this award, making this the perfect ice hockey award.